(Ottawa) The situation around Eldorado Gold Corporation’s mining projects in northern Greece is extremely tense. In the face of negative official response to social and environmental concerns from the company, Greek authorities, and even the Canadian Ambassador – a delegation from the affected area has come to ask Canadians for help. The Canadian government strongly supports extractive resource development in Canada and internationally, where Canadian companies dominate the mining sector. It relies on “host” countries to regulate such operations in the absence of any relevant and binding international regulations. MiningWatch Canada spokesperson Jamie Kneen notes that the Greek delegation’s travel to Canada to appeal for support demonstrates just how weak this approach is, and how negative the effect is that Vancouver-based Eldorado Gold has had on the region. The Greek delegation consists of Vaggelis Lampakis, the Mayor of Alexandroupoli, Thrace; Tolis Papageorgiou, of Halkidiki; and Maria Kadoglou, of Hellenic Mining Watch (not affiliated with MiningWatch Canada). They are hoping to alert Canadians to the tension around Vancouver-based Eldorado’s proposed Skouries and Perama Hill mining projects, and to garner support for their work to stop the projects. The delegates have spent the last four days in Canada engaging with Members of Parliament, Eldorado Gold investors, and the Canadian public on how Eldorado’s proposed Skouries and Perama Hill mining projects are inappropriate for the region, which largely depends on agriculture and tourism and deteriorating the social fabric of the communities. The group says the company has taken advantage of Greece’s economic crisis and support from the Greek government to push ahead in the face of massive public opposition - ironically, in the very birthplace of Aristotle. The environmental assessment process for the Perama project has been suspended, despite the project’s “fast track” designation under Greek ‘austerity’ measures. 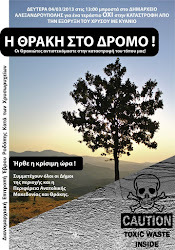 The Skouries project has its general environmental approval but still requires specific permits for many aspects of its construction and operation, although Kadoglou says the company has started work without waiting for the needed permits. Vaggelis Lampakis, the Mayor of Alexandroupoli, says Canadians - including Eldorado shareholders and the Canadian government - need to understand that Thracians are united in their opposition to the Perama project. “We are talking about a million-tonne open pit cyanide heap-leach gold mine just 500 metres from the nearest village and 500 metres from the sea. We are open to investment, but there is no way this project can be acceptable. All 22 mayors from the region have pledged their opposition, and if they try to build this mine we will stand in front of the bulldozers,” he says. The delegation also notes Canada’s increasingly negative international reputation, including the Canadian government's involvement through the Canadian embassy in Greece, funding from Export Development Canada and investments by public pension plans. Mayor Lampakis, Mr. Papageorgiou, and Ms. Kadoglou are making stops in Montreal, Ottawa, Toronto, and Vancouver during their time in Canada. The tour is co-sponsored by the Council of Canadians, the Greek Canadian Committee for Ethical Mining, and the Pan-Thracian Society of Ontario. Contact: Jamie Kneen, MiningWatch Canada: jamie(at)miningwatch.ca; (613) 569-3439 office; (613) 761-2273 cell. Αναρτήθηκε από ΧΡΥΣΩΡΥΧΕΙΑ στη ΘΡΑΚΗ STOP στις 7:03 μ.μ.